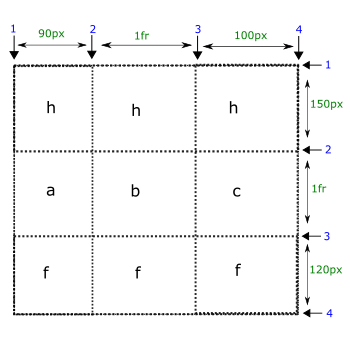 grid-template-areas property represents named areas withing a grid. These grid areas may consist of more than one cells. These named grid areas are used by other grid properties to place the items. A grid area covers up one on more adjacent cells and is bounded by four grid lines. It may contain one or more items. Number of cells in a grid area determine the size of grid area. It gives us an idea about the structure i.e. how many rows and column are in the grid. The value of grid-template-areas is none or space separated list of strings. The following are the values of a grid-template-areas. It represents that no named grid area is created and thus there is no track. There are few rules that need to be considered while using string as the value. A string consists of space separated named tokens (area names) within double quotationa marks. Sequence of dots ('.') in a string means a null area. Spaces are nothing to do but separate the named areas. Any other characters used as the token names create null areas. The named tokens in a string that start with numbers such as "5th 6th 7th" have to be escaped while using their names in other properties such as \35th means 5th area. The grid-template-areas property has been covered up completely. If you are an advanced learner and want to get more on grid-template-areas property, continue to the remaining part otherwise skip to the next tutorial. There are two methods to place the items within a grid. One method use grid-template-columns and grid-template-rows in which we specify boundaries for an item within a grid. The second method uses grid-template-areas in which we use named areas to place the items within a grid.